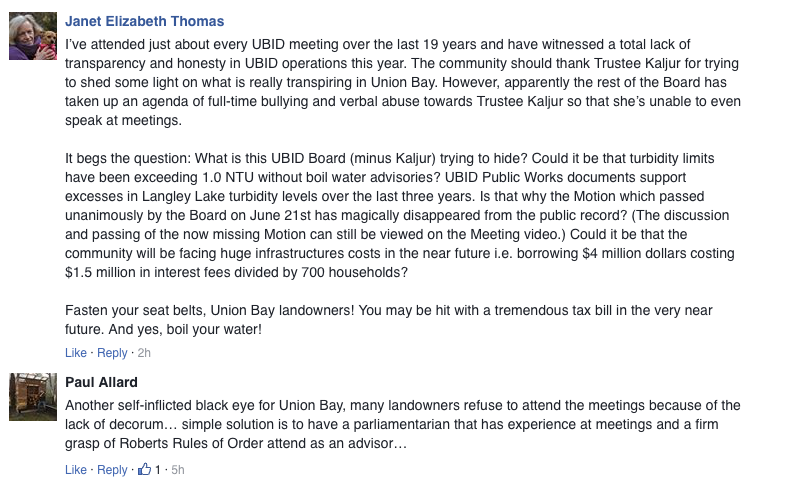 UNION BAY, B.C- The elected officials of the Union Bay Improvement District are having trouble getting along. Last night, the board held its regularly scheduled public meeting, which was attended by all the trustees. Due to UBID’s chief administrative officer Gordon Mason being sick, he was not in attendance, and UBID chair Ted Haraldson was supposed to have read the CAO’s report. However, the meeting did not start smoothly. When the question of approving the minutes of October 18th came up, trustee Susanna Kaljur indicated she wanted to make a correction to the written record. 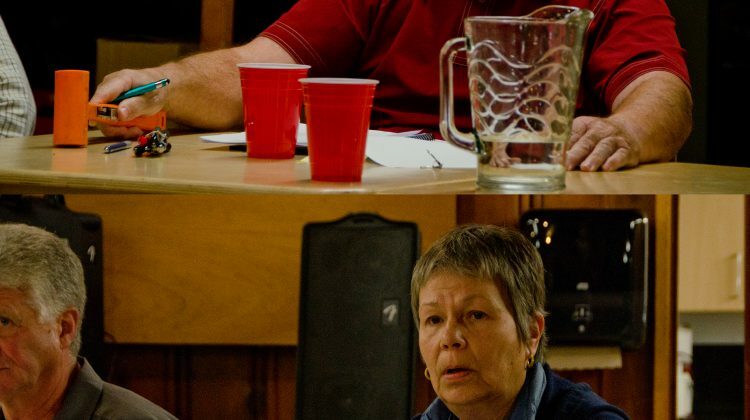 At that previous meeting, Kaljur had left after a disagreement with Haraldson and the other trustees over a report from the district’s public works manager, concerning practices about turbidity measurements and the issuing of boil-water notices. Kaljur indicated she did not agree with the minutes as written, and desired for a correction to be read out by Haraldson and then voted on by the board on whether or not to include the correction. 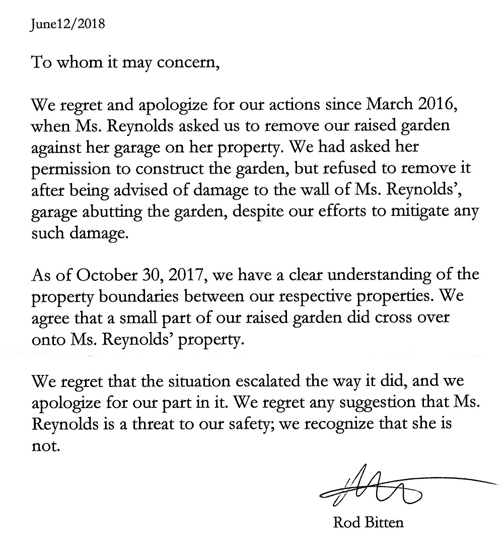 She never did manage to get that correction read, due to multiple interruptions by other trustees which escalated into a yelling match between Kaljur and the rest of the board. At one point, Haraldson threatened to call the RCMP after indicating he wanted Kaljur removed. After Kaljur left her seat from the trustee table and went to sit with the public, Haraldson adjourned the meeting. Kaljur and around three quarters of the people gathered at the meeting then left the room. 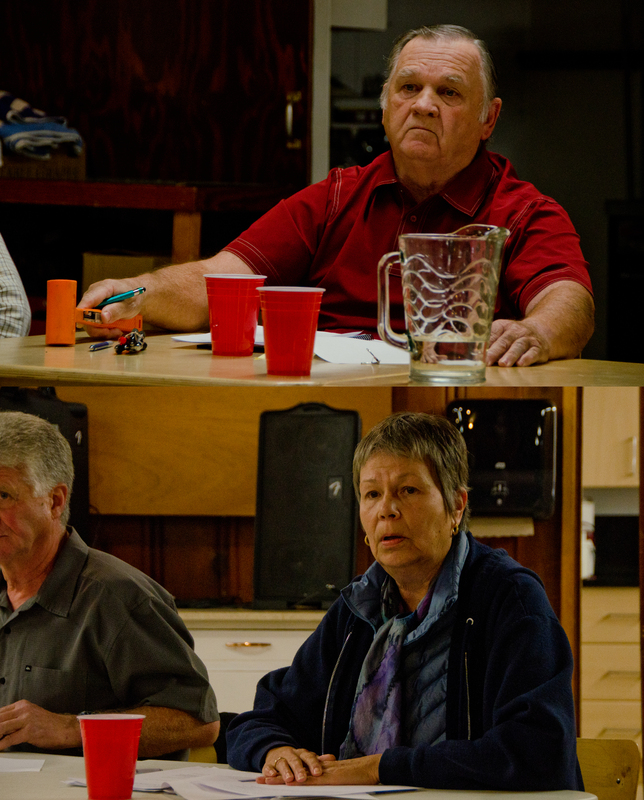 Immediately after the adjournment, Haraldson told the MyComoxValleyNow.com newsroom that the meeting was closed due to disruptions, not going by the rules and the UBID’s own bylaws. “I will not let a meeting get out of control,” said Haraldson, at the time. He said that landowners would be informed of the details contained in the CAO’s report, and had previously indicated that would be accomplished by posting the details on the UBID website. He also indicated that the report Kaljur had been seeking would be coming out in the near future. “A report is coming out,” said Haraldson. As for whether or not he would speak with higher levels of government to try to work out the chaotic UBID meetings, Haraldson said “we have choices that can be made”. “Those will be followed through if necessary, I’m hoping not,” said Haraldson. After that statement, Haraldson was approached by trustee Peter Jacques, who asked to resume the meeting. The gathered trustees, minus Kaljur, returned to their seats and the meeting got underway. Kaljur and the residents who left did not return during the rest of the meeting. During Haraldson’s reading of the CAO’s report, it was stated that the water treatment plant project is on-schedule, with design work ongoing and construction planned for February and March. A “source to tap” report on UBID’s water system is also in the works, and the district has been having productive meetings with Island Timberlands about efforts to protect Langley Lake from any ill effects caused by nearby logging. The reading of the reports and the rest of the resumed meeting proceeded without disruption, and it ended after trustee’s voted to cancel the December 20th meeting as it appeared many people would be on vacation. Reached afterwards for comment, Haraldson said Kaljur’s concerns about turbidity were misinformation. As for the shutdown of Kaljur’s attempts to raise her concerns about the previous meeting minutes, Haraldson believed what had transpired was appropriate. “I think that was appropriate because she wasn’t there, and making a correction, to try to turn around and make it sound like something else, is not right,” said Haraldson. He also said there had been a show of hands and a vote to pass the previous meeting minutes. As for what he planned to do to resolve the differences between Kaljur and the rest of the board, Haraldson stated there were “are number of directions they could go”. “Legally, I can have her removed,” said Haraldson. He indicated he was willing to have called the RCMP, if he thought it was needed. Haraldson also indicated he had issues with the way Kaljur communicated to other levels of government, independently of him. 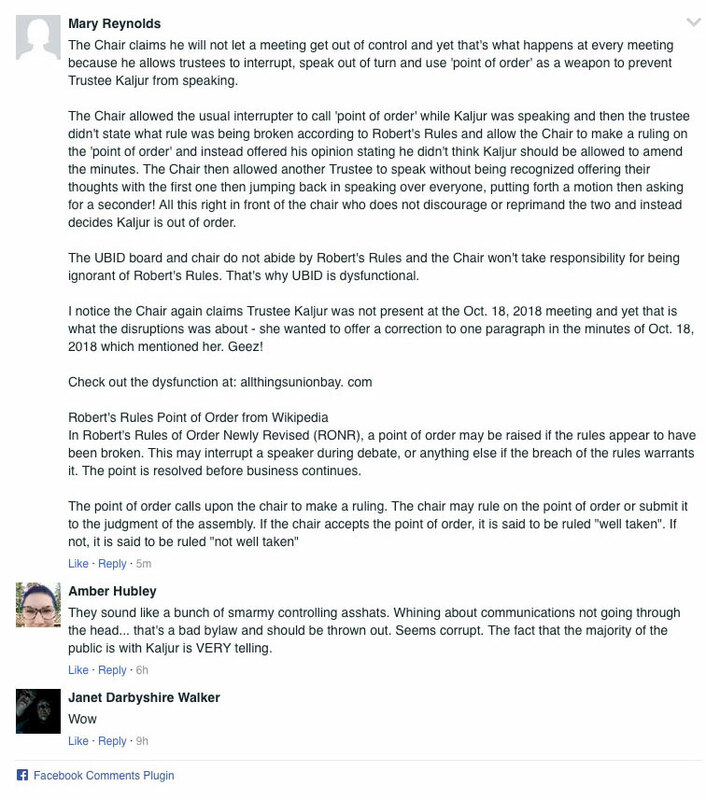 Under UBID rules, he indicated, communications are supposed to pass through the chair. “Any correspondence that she wants to pass on to the ministry (Municipal Affairs), goes through the chair,” said Haraldson. As for whether or not he would reach out to higher levels of government to discuss what had happened at the meeting, Haraldson said it was a possibility. “Whether it can be resolved or not, I do not know,” said Haraldson. The MyComoxValleyNow.com newsroom sought comment from Municipal Affairs, who sent the following statement. “The ministry acknowledges that the Union Bay Improvement District Trustees have had disagreements on issues affecting their community,” read the statement. Comment was also sought from Kaljur, who replied with the following statement. “Firstly all the trustees should be given training in deliberative process,” said Kaljur. Kaljur also said the board of trustees does not want her opinion to be heard. “That is unconstitutional,” read her statement. The video recording of the November 15th meeting will be made available on the UBID website.